About Bluetooth: The wireless module Bluetooth can be used for two reasons. One is whether your wireless module has Bluetooth function, and the other is to use the DuPont line to route the USB signal cable of the wireless network card module from the adapter card. On the motherboard, this adapter card does not match the DuPont line, so Bluetooth cannot be implemented. 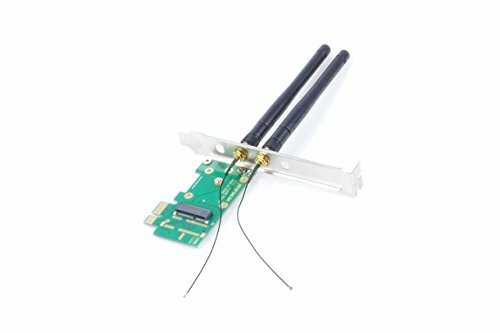 1: This product only supports A+E key and A key M.2 NGFF wireless network card type wireless module. 2: Some M.2 NGFF wireless network cards only support Windows 10 operating system (9260AC, 9260NGW only supports win 10 system). Some M.2 NGFF wireless network cards do not support AMD motherboards (such as 9560AC, 9260AC does not support AMD motherboards). 3: Not all M.2 NGFF wireless network cards can be used. Before buying a wireless network card, you should communicate clearly with the seller of the wireless network card! Also note that the M.2 NGFF wireless module removed from the computer may not be compatible if it is installed on another brand computer! 3: The adapter card does not need any driver, because the adapter card does not carry any chip, there is no chip, so there is no such problem as driver and compatibility. You need to install the driver of your own wireless network card module itself, wireless. The NIC module does not have a driver or the driver installation error does not work properly! 4: The riser card only changes the interface form of the wireless module and does not change any performance of the module. Special statement: This adapter card is theoretically applicable to wireless modules of A+E key M.2 NGFF and E key M.2 NGFF, but some brand computers use OEM custom wireless M.2 NGFF wireless module, pin definition of interface Different, this is an individual phenomenon, it is best to consult before sending a physical photo. Also, be sure to have space on your computer! This adapter does not support any AVI and E key wireless network cards of CNVI (such as Intel AC 9560, AC 9461, AC 9462, etc. E key M.2 wireless network interface. Because CNVI specification will use dedicated CNVI channel, CNVI The MAC part of the network card will be integrated inside the chipset. It is common to say that some functions of the wireless network card will be directly integrated. This uses a special design to create a barrier for Intel. As long as one end of the network card and chipset is not Intel recommended The CNVI specification will not start. For example, AMD chipset and CNVI network card, or CNVI slot and non-CNVI network card, or non-CNVI slot and CNVI network card . If you have any questions about this product by TOFKE, contact us by completing and submitting the form below. If you are looking for a specif part number, please include it with your message.